Wild Rose Wine in Vaseline, Bargain Shack offers Boyd Glass, Mosser Glass, L.G. Wright, and Contemporary Collectible Glass including Vaseline Glass - J.B. Scottie Dogs, Pooche, Animal Covered Nests, Toothpick Holders, Salts, Glass Animal Figurines, Clowns, Dolls, Slippers, Vehicles, and More! Wild Rose Pattern Wine glasses make an elegant statement. Their craftsmanship with the high relief wild rose pattern shows a dedication to beauty and design. 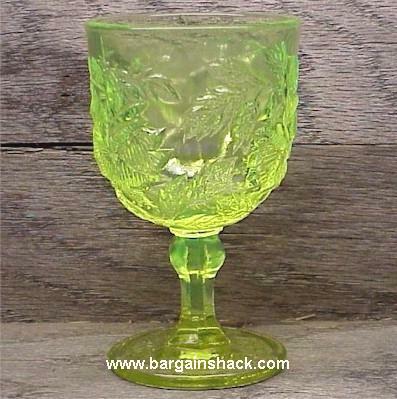 Each wine glass was individually handcrafted and stands 5" tall.This wild rose wine is made from beautiful yellow green vaseline and has a beautiful glow under a black light!